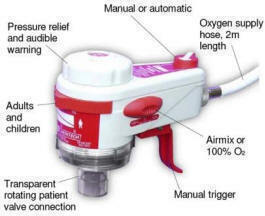 The microVENT® was developed in the 1990’s following the publication of British Standard “BS 6850: 1987 Ventilatory resuscitators” and “ISO 8382 Resuscitators intended for use with humans”. The designers were able to take into account the latest thinking on resuscitators and incorporate this into a package meeting the latest European and international standards. The microVENT® moved away from the traditional package where a separate control module away from the patient had to be accessed to control ventilation. The microVENT® packs all the controls into the handset / patient valve to give the best control and patient care, accessible while treating and observing the patient. Component miniaturisation and innovative design resulted in a unit that was lighter and more compact than any other comparable product the designers had seen. The design was considered so original that it was able to be patented: UK Patent No.2270629. USA Patent No. 5537999 & 5351361. Canada Patent No. 2107358. European Patent No. 0578679. The next few pages explain in some more detail some of the benefits available from microVENT®. 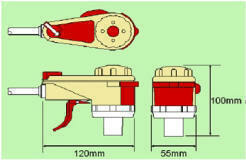 Handheld resuscitator with compact dimensions and light weight. Ergonomic styling gives easy operation with controls in natural position. Constructed within a tough reinforced plastic casing the Meditech microVENT is designed to withstand use in difficult situations. microVENT patient valve features 22/15 mm connections to take standard airway devices and facemasks. The oxygen supply hose is two metres long and made of resilient reinforced plastics to retain its flexibility in cold conditions. A BS medical oxygen supply probe enables use with all standard portable and piped medical oxygen supplies. Excellent visibility of patient and resuscitator controls.